Welcome! This is believed to be the first comprehensive history ever attempted about the 14th. It is very much a work in progress. Contributions of information, including photos of people and places, as well as souvenirs, maps, official documents, letters, memoirs, stories, etc., that could help 'flesh out' the 14th's history, are both encouraged and welcomed. To learn how you can assist in this effort, please visit the Help Needed page. Everyone who contributes information and/or photos used on this website will be credited by name on the Contributors list. 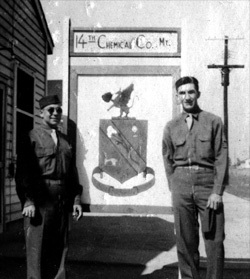 Please help re-construct and preserve the memory of the men who served in the 14th. Thank you! Covers 14th's activation, staffing, and initial training and testing at Fort Rucker, Alabama. Army war games in Tennessee, repair of CWS equipment at various U.S. bases, final preparations and testing at Camp Gordon, Georgia, movement overseas, arrival in the United Kingdom. Final training in England, landing at Omaha Beach in Normandy, advance across France through Paris into Belgium. Advance into Germany, Meritorious Service Unit Award, end of war in Europe, return to the USA, assignment to Fort Polk, Louisiana. Related memories about the 14th and/or places it went. Created August 25, 2001. Last updated March 8, 2009.